Frugal & Fabulous: Wholly Guacamole - One Lunch - Two Ways! Wholly Guacamole - One Lunch - Two Ways! One of the ways I save money is that I almost always bring my lunch to work. Now I know brown bagging it can get kind of a bad rap sometimes, but I try my hardest to keep my lunch interesting and to mix it up from week to week. I'll bring sandwiches, salads, leftovers, or whatever else I can come come up with. One of my favorite things to cook (and eat) is Mexican food. From burritos to enchiladas to taco salad - I make it all and I often bring one of these things for lunch! 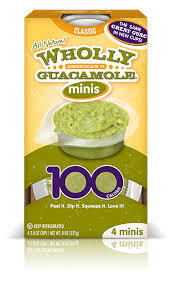 And one of my favorite ways to jazz up my lunch is with Wholly Guacamole 100 calorie packs. I took these lunch pics with Wholly Guacamole 100 calorie snack packs. Basically these are two different lunches/snacks- with basically the same ingredients. Wholly also makes some convenient and easy to pack 100 calorie minis (picture at left). These are great because you can just unwrap the package and dip right in! One of my lunch options would be 'make your own nachos' with cheese, sour cream, salsa, beans, chicken and wholly guacamole snack packs or minis. The other option would be to make chicken and cheese quesadillas either the night before or the morning of and pack that along with some beans (and/or rice) and with some delicious toppings like salsa, sour cream and of course wholly guac! Add a side dish like a piece of fruit or chopped up vegetables (I packed sliced cucumbers) and you've got a great, fulfilling lunch on the cheap! I like having a couple options that use the same ingredients because then you can mix up your lunches day to day but also feel like you're eating something different. I also like that these combinations could be modified for either a child or an adults lunch- customized by their particular tastes/needs. On a third day you could take any leftovers you have and dump it over the top of a salad to make a nice taco salad - healthy and delicious! I love Wholly Guacamole packs and love to keep them around for lunches or a quick snack! I typically keep them in my freezer and then pull one out on the day I need it. One of my favorite go to meals is a turkey, bacon and cheese sandwich with wholly guacamole as a spread (instead of mayo or mustard). This sandwich is to die for (especially if you grill the bread first!) yum! My husband and I love them! Win it: Wholly Guacamole is doing a contest called OMGuac your lunch: Stop by eatwholly.com/omg, for some great ideas, a coupon and a chance to win $100 gift card with FREE Wholly Guacamole products! Three winners are chosen weekly through Sept. 27. The One Lunch, Two Ways gives you inspiration on how to create two completely different lunches with most of the same ingredients! Take a look and print out the shopping list for your favorite ideas. Buy it: Wholly Guacamole is found in most grocery stores and super stores such as Walmart. What's in your lunch this week? Have you ever tried Wholly Guacamole? Let me know!